With the realisation on August Bank Holiday that none of my going out clothes (my beautiful clothes) fit properly and after how many months of illness finally gone, I knew it was time to do sometime about my weight. I'm not going to put my weight on here, as quite frankly I'd rather stab myself repeatedly in the eye, however what needs to be considered is the fact that I'm 5'10 and I can hide weight quite easily. I'll be honest with you, the figure on the scales made me feel physically sick, since February I'd managed to put on around 18lb, lost all my muscle and basically looked and felt a mess. So apart from drastically turning my diet around and having very minimal treats (but a cheat meal/uber snack every Saturday or Sunday) and finally going back to the gym, the weight has begun to fall off. However in order to get the weight loss off to a good start, ie give my metabolism a good kick in the backside, I decided to try Bootea after reading and seeing so many good reviews about this. 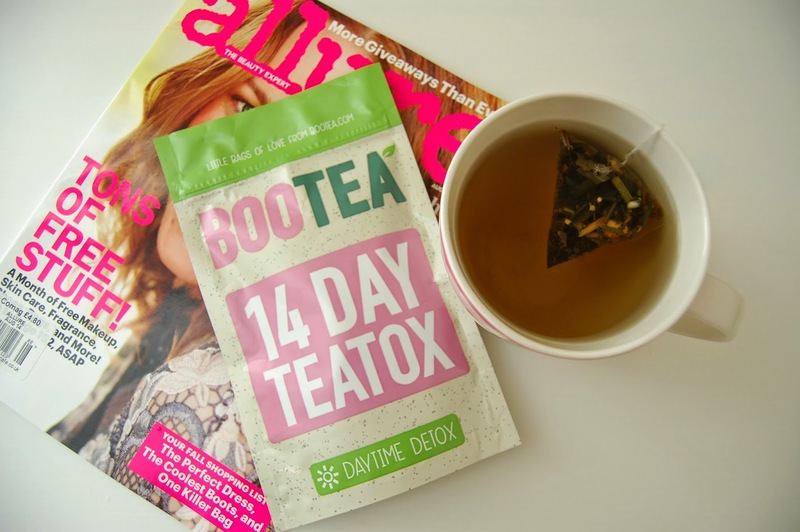 I decided to only do the daytime teatox as I had read that the night time one gave many people stomach cramps similar to an upset stomach and I didn't want that feeling whilst at work. Initially I was only going to do this for the 14 days, however I ended up doing this for 28 days straight then had a break (diet and exercise still continued). Personally I'm not a fan of herbal teas and it took me many months of drinking cold green tea before I got used to that (and still I'll only drink Tetley's decaf) and the same applies to this - I really don't like the taste of this, so I wait until it's cold and then drink it, followed by a glass of water to get rid of the taste. What I have noticed with this, when you first start the teatox is that you need to go to the loo (not for a 2) a lot, however obviously this may be to do with the large amounts of water I was drinking too - however the way I saw it, was that your body is flushing away the bad stuff from inside you. If I'm honest with you, I did go into this with a bit of a sceptical mindset - I wasn't convinced that a teatox would help with weight loss, yet part of me thought that even if I lost a single pound after the 14 days its better than nothing and its a step into getting back to my pre-house move/illness weight. I decided to weigh myself after the first 7 days and surprisingly I had lost 4lb which I was amazed at. Second week I lost a lb and then after the following 14 days I think in total I had lost 10lb by the end of September. Before starting this, I was under the mindset that I wanted drastic figures to get the weight off asap, however I've finally come to realise that by taking it slowly the weight comes off and stays off. I've had bad weeks yet as long as I know to go to the gym, the weight isn't going to go back on. I want to do a separate post about my diet/exercise plan. Since doing the initial teatox I have done another 14 days mid October (yes I even brought it to Birmingham with me for FABB) and all in all I've lost 15lb. Don't get me wrong I can tell in certain clothes that I've lost some weight and one pair of gym bottoms are not stupidly big on me, however I still have a long way to go, once the weight is off, its time to focus on toning back up. I hope this was helpful to you, however please remember to diet and exercise sensibly.